Science fiction isn't a genre I usually gravitate toward, with the exception of dystopia. 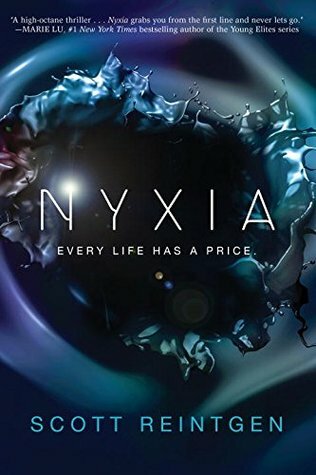 So many friends raved about Nyxia (and the cover was so pretty) that I finally decided to grab it on audiobook from my library. I went in blind so I had no idea what to expect and Nyxia definitely kept me interested! Emmett is the protagonist of this story and he has been chosen by the Babel Corporation to go to another planet, along with a group of other recruits with similar backgrounds, to mine Nyxia. He and his family will be well paid, but he soon learns that his spot is not guaranteed. Instead, he has to fight the others onboard the ship to earn his place. Emmett was a great main character. I sympathized with him and his situation. I wanted him to win because I wanted his family taken care of! One of my favorite things about Nyxia was the friendships. Yes, there's a bit of a romantic subplot, but the friendships really take the spotlight in this book. The other kids, while all from similarly troubled backgrounds, were equally sympathetic. Some were much easier to like than others, of course, and some were downright villainous. But overall the chast of characters was diverse and well developed and I really enjoyed them! I will say, Nyxia was a bit Hunger Games-esque. (I've also seen it compared to Ender's Game more than once.) Kids placed in an environment where they're forced to fight to the death (not always intentionally) to earn a chance at a better life. There are twists and turns and mysteries and the plot is all very interesting. Still, as I get older I'm having a harder time suspending my disbelief about corporations/governments/adults pitting teenagers against each other in such brutal ways. The world of Nyxia is certainly interesting, but it's confined to a spaceship in this book. I anticipate getting to know more of the world in book two. I thought the Nyxia itself was a really unique concept, though I wish there had been a bit more explanation about how it worked. I definitely think this world is off to a great start and has a ton of potential to be amazing! Overall, I enjoyed Nyxia and I'm interested to see where the story goes in book two. I enjoyed Emmett and I'm a sucker for books with surprising twists! I just hope that Nyxia Unleashed presents more answers to the questions set up in this one.